Some weren't content to stay back with the crowd, and instead took a few extra steps forward in defiance. Others were singled out from many and become a victim of deadly violence. Still others were bystanders. Inspired by Turkey's "lady in red" whose picture went viral this week, we look back at the people who became, often inadvertently, the face of protest, a rallying cry for the like-minded because of an iconic picture or video. Above, a Turkish riot policeman uses tear gas as people protest against the destruction of a park, in Taksim Square in central Istanbul, on May 28, 2013. 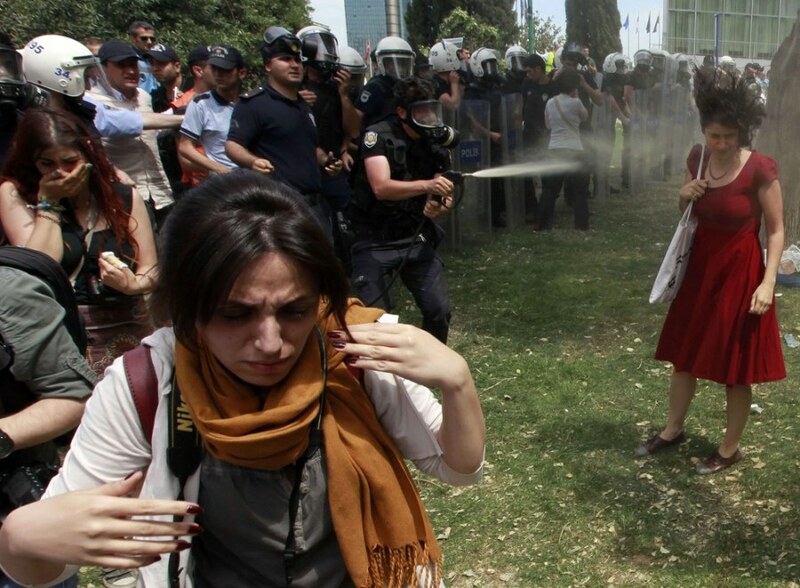 The woman in the red dress, identified by some news organizations as academic Ceyda Sungur, became the icon for continued anti-government demonstrations in dozens of cities throughout Turkey. The protests began as a campaign against the redevelopment of Gezi Park in Istanbul, but have grown into an unprecedented show of defiance against the perceived authoritarianism of Turkish Prime Minister Tayyip Erdogan and his Islamist-rooted AK Party. Read more and see a sequence of images from the event. 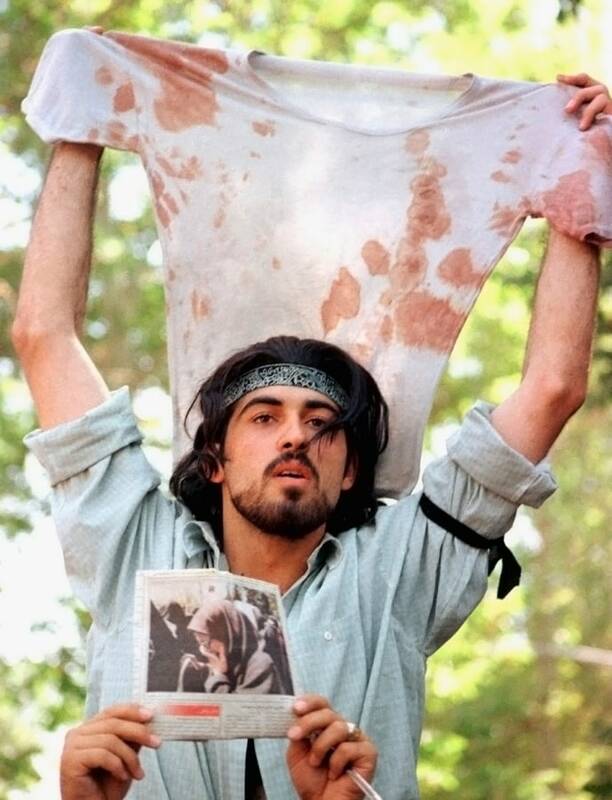 Ahmad Batebi joined other students from the University of Tehran in a mass protest against the government on July 12, 1999. When a fellow protestor was shot, Batebi used the man’s shirt to treat his wounds, then held the shirt above his own head. That image, above, made the cover of The Economist, drawing the attention of authorities. Batebi was imprisoned by the Iranian government where he said he was tortured for years before his escape to the U.S. in 2008 where he was granted asylum. Batebi eventually became a human rights activist and was hired by Voice of America. 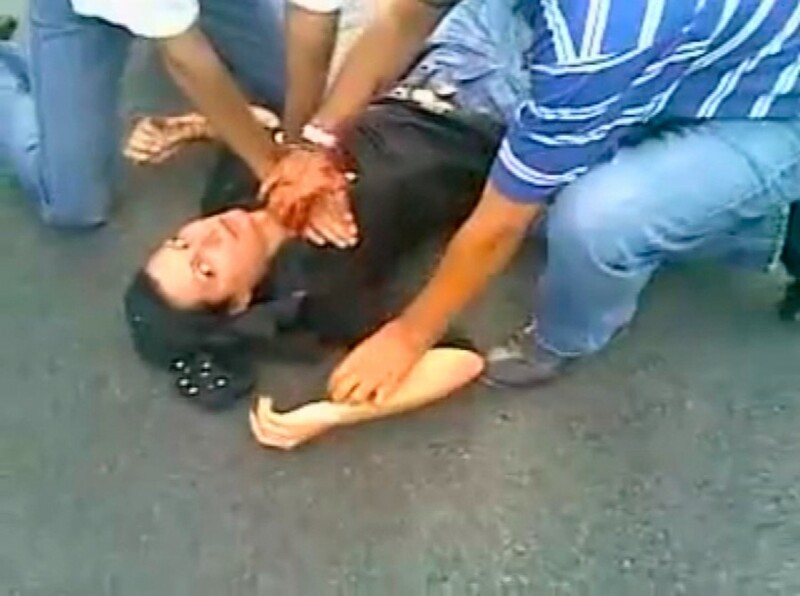 Above, a screen capture from YouTube shows a woman identified as Neda Agha-Soltan lying on the ground after getting shot in the chest during a street protest in Tehran on June 20, 2009. The protests, dubbed the Green Revolution, were in reaction to the disputed re-election of Iranian President Mahmoud Ahmadinejad. Video of her death was watched by millions on the Internet, and her image became a rallying point for Iranian opposition supporters around the world. Below, the lead-up to the Chinese government's bloody Tiananmen Square crackdown began with impromptu student demonstrations that gained steam as Beijing mourned the death of former Chinese Communist Party leader and liberal reformer Hu Yaobang on April 22, 1989. Crowds in Tiananmen Square called for greater freedoms and condemned rampant inflation and corruption. Hundreds, possibly thousands, of protesters were later killed by China's military on June 3-4, 1989 as communist leaders ordered an end to six weeks of unprecedented democracy protests. 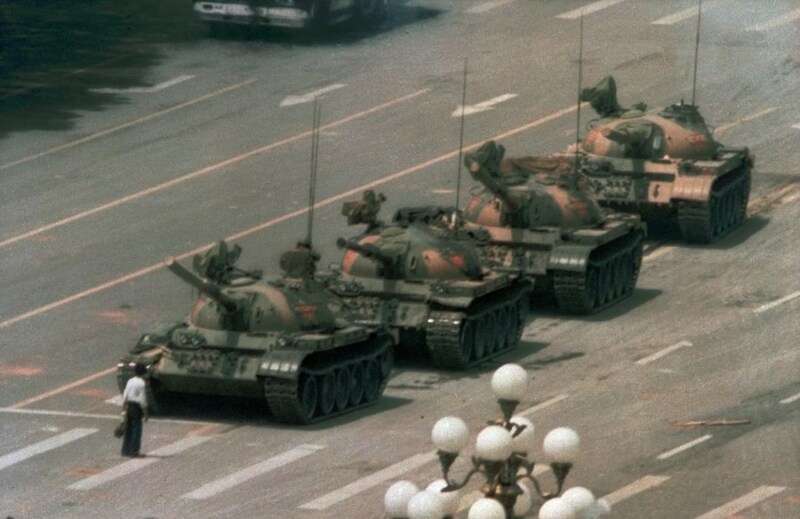 "Tank man," a solitary young man facing down a column of People's Liberation Army tanks on June 5, 1989 would become the iconic image of the Tiananmen tragedy to the outside world. The man, calling for an end to the violence against pro-democracy demonstrators, was pulled away by bystanders, and the tanks continued on their way. The Chinese government crushed the student-led demonstration for democratic reform. View a report from the time. 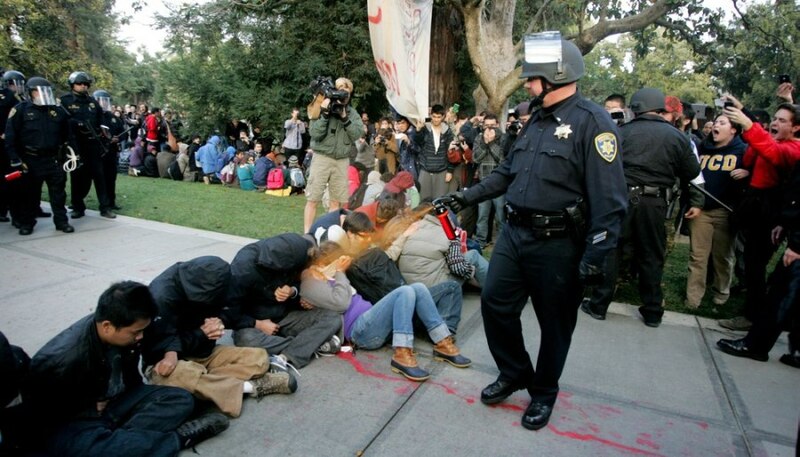 A University of California Davis police officer pepper-sprays students during their sit-in at an "Occupy UCD" demonstration in Davis, Calif., on Nov. 18, 2011. UC Davis Chancellor Linda Katehi apologized to jeering students on Nov. 21 for the use of pepper spray against campus protesters in the standoff captured by video and widely replayed on television and the Internet. Their encampments are largely gone now, but the Occupy movement is far from dead, with organizers in the American heartland focused on a next wave of protest. It was Oct. 21, 1967, when one of 250,000 demonstrators in Washington D.C. made a nonviolent gesture towards soldiers braced for trouble during a protest against the Vietnam War. According to a 2008 Los Angeles Times article, a lieutenant marched a squad of guardsmen with guns drawn into the sea of demonstrators at the mall entrance of the Pentagon and formed a semicircle around a group of anti-war protestors. "And this young man appeared with flowers and proceeded . . . (to) put them down the rifle barrel," said then Washington Star photographer Bernie Boston during a 2006 interview on National Public Radio. Perched on a wall overlooking the scene, Boston proceeded to take photos. "I knew I had a good picture," he said, but his editors saw it differently and buried it deep inside the newspaper. 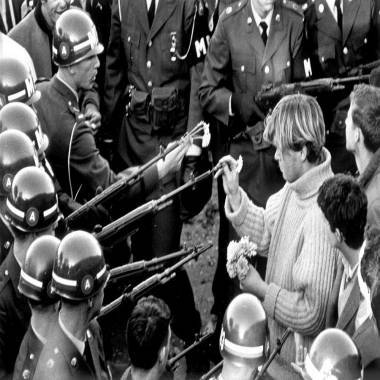 It wasn’t until later after the photo, titled Flower Power, won several awards and was nominated for a Pulitzer that it became a symbol of the movement for which it was named. Boston never identified the protestor, so there is some dispute on his actual identity, but its most widely believed to be George Harris, an 18-year-old actor, from New York. What other images catapulted an unknown person into the limelight? Comment below to share your ideas.